Meal prep has changed my life. Okay, maybe I still deal with the morning stress of getting kids dressed for school or sitting at yet another red light on the way to dance practice, but it’s changed my mealtime routine for the better. Not only do I save time and money, but meal prepping has greatly improved my family’s eating habits as we always have healthy food on hand. It’s not to say we never eat fast food (real talk: my girls have after-school activities almost every night of the week. Even on my best meal planning weeks, life happens and hitting the drive-thru is nothing to be ashamed about), but with meal prepping, there’s less of a reason to hit up the closest drive-thru. Looking back at my early days of meal prepping, it can be a little overwhelming to get started. I’ve rounded up my top 10 tips to introduce you to meal prep in an easy and sustainable way. Start slow. There’s no reason to get bogged down trying to prepare 20 containers of food and end up getting overwhelmed. Start with something as simple as prepping your produce. I like to chop up the items I use most often like onions, peppers, and broccoli. That way, if I’m making an omelet or about to sauté ground turkey for tacos, I can add in those chopped veggies instead of pulling out my cutting board and knife, saving me time and clean up. This also encourages me to add more veggies to dishes since they’re already cut and ready to go. Do the same with fruit so you always have a quick snack on hand or can add to parfaits, oatmeal, and salads. One meal at a time. Your first meal prep session is going to be pretty long and tiresome if you decide to prepare breakfast, lunch, dinner, and snacks. Think of the meal time that you struggle with and start there. Is it that you have no time in the morning to prepare breakfast? Or you get home late from work and need a quick dinner solution? If you have veggies prepped ahead of time, you can throw together one of these easy sheet pan dinners in just minutes. Start with what you know. Turn to the recipes that are already a hit with your family and simply double the batch to save for later in the week or freeze for another time. No need to get overwhelmed picking up a new habit while testing new recipes. As you get more comfortable and find the types of foods that work best when reheated, move on to new recipes. 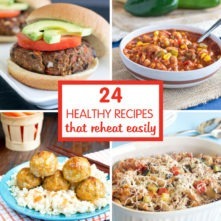 Speaking of reheatable recipes, check out this list of 24 yummy options! Go for multi-use foods. You don’t necessarily have to prepare 20 perfectly-portioned meals with side dishes included. I like to prepare different parts of my meals and mix and match. For example, I’ll make a big portion of ground turkey with mild seasoning and use it for omelets, salads, tacos, pasta dishes, rice bowls and more. Getting dinner on the table seems less daunting when I know the main dish is prepared and I just need to whip up a quick side of rice, roasted veggies, or pasta. Invest in your tools. I can’t tell you how often I rely on my slow cooker (Amazon link) to whip up easy meals that I can freeze for later. Also, high-quality plastic or glassware is important especially if you’ll be meal prepping every week. 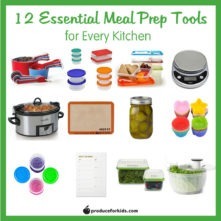 We rounded up our top 12 meal prep essentials to help you build your collection! Recruit your kids and turn meal prep into a family affair. Kids get to hone their kitchen skills and it helps to have a few extra sets of hands around. 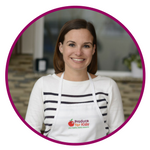 My little ones love to wash fruits and veggies, mix ingredients and read recipes out loud. Check out these kid-friendly kitchen tasks for every age. Multi-tasking is your best friend. Make the most of your kitchen space and tools in the shortest amount of time. You can roast a sheet pan full of veggies, cook up quinoa or brown rice and add chicken to a slow cooker (Amazon link), all while prepping mason jar salads and chopping fruits and veggies for the week. Shop smart. Make a meal plan before going to the grocery store to avoid over buying. I’ve definitely had those weeks where I go in without a plan, buy a lot of random items, and end up having to throw away food that has gone bad. Focus on the meals you know you’re going to make and if you’re not sure if you’ll get to something, buy the frozen variety to use in other ways. Focus on in-season produce. Save money and ensure you’re getting produce at its peak by focusing on seasonal fruits and veggies. 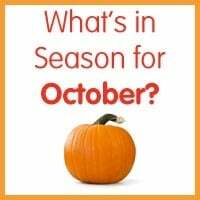 Download our What’s in Season calendar and keep on hand when making your shopping lists. Invest in your spices and condiments. While meal prepping is extremely helpful, I tend to get bored if I don’t switch up my recipes and flavors. Personally, I’m big on sauces and love how they can completely change a meal. Meatballs are often part of my meal prep and I switch them up week to week by changing the seasoning and sauce. I’ve made buffalo meatballs, sesame ginger, honey garlic, and traditional marinara. Changing up your flavors with different dressings, sauces, and seasoning can go a long way in avoiding a meal prep rut. Ready to start meal planning? Grab these free printables below to plan out your family’s meals for the week and shopping list! The most important tip of all: don’t stress it. Keep these tips in mind, accept that there might be a learning curve at first, and in a few weeks you’ll be a meal prep pro! Free Meal Planning Ebook + a Chance to Win! Save time and money in the kitchen with our free meal plan ebook, complete with a full week’s worth of breakfast, lunch and dinner ideas. Plus, we’re giving away a different meal prep prize each week. Enter to win and grab the free ebook below! hi! I’ve been trying to print your free weekly meal planner as well as the shopping list but only the list seems to work on both links.